The striking, versatile look of the “Nuranar” collection will bring warmth and relaxation to any room of your home. Featuring unique upholstery, padded headrest and armrests, and oversized stitching detailing. 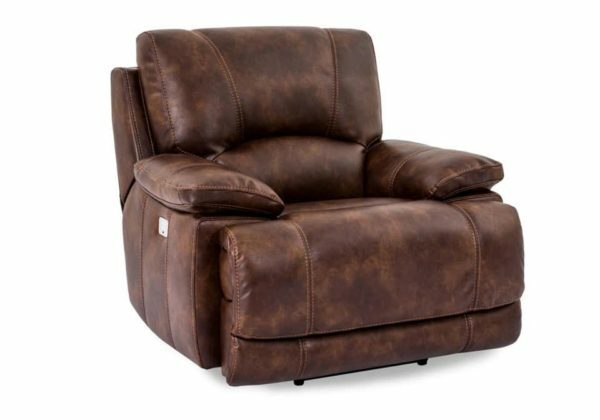 Throw in the added benefit of a reclining and you are set for all your relaxation needs! No sag suspension with seat zone support and 100% hardwood and hardwood plywood frames bring together a supportive comfort. All frames foam encased to protect fabric. 2.0 high density foam for seat cushions cause the comfort you deserve. Inner bagged and baffled fiber fill retains shape so it never looks old. For a more information about Cheers Man-Wah’s warranties, click HERE. Under these Limited Warranties, the sole liability of Cheers Man-Wah is limited to repair, or at its option, replacement. Cheers Man-Wah will pay, within one year from the date of purchase, reasonable and customary labor rates to repair or replace the defective parts and shipping costs from the retailer to and from Cheers Man-Wah at no charge to the original retail purchaser. After one year from the date of purchase, the original retail purchaser will be responsible for labor, packing, and all shipping and transportation costs. Cheers Man-Wah is the global leader in reclining living room furniture. Known for their unparalleled value in the motion category, Cheers Man-Wah supplies most of America’s top 50 furniture retailers. Founded in 1992, Man Wah Holdings Limited is the world’s largest manufacturer of motion sofas with headquarters in Hong Kong, the Group has a presence in all of the major markets and cities of the world, including the US, Canada, United Kingdom, Europe, South Africa, Australasia, China and Singapore.